the carcase panels were rabbeted in such a way that it left a small 1/8-in. void at the corners of the assembled boxes. This void was filled with walnut banding and making this banding is what we’ll cover in this new video. Once again, the kerfing plane and frame saw combo were utilized for this application. an 8/4 piece of walnut is dimensioned and the adjustable fence kerfing plane is set to take a 1/4-in. cut. 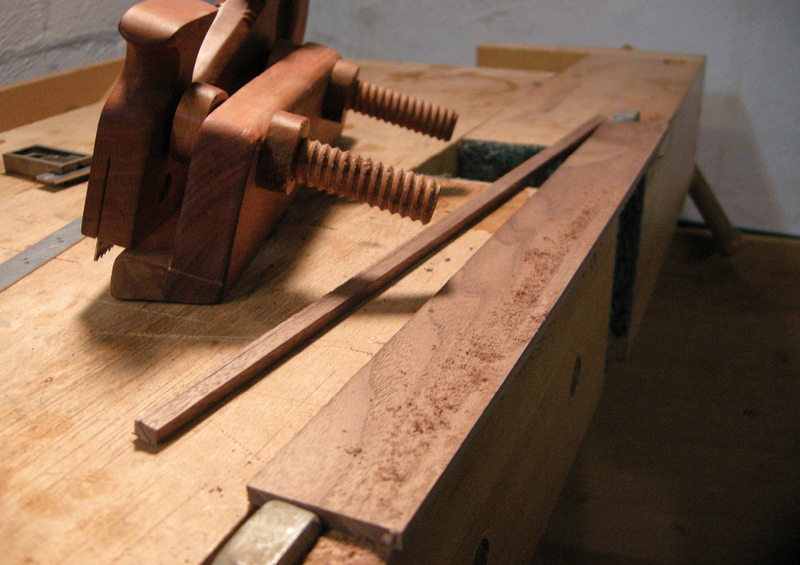 The kerf is sawn, around the perimeter of the walnut, and then the frame saw is used to rip the stock. and then clamped flat in the tail vise and the kerfing plane is used to rip the stock further into banding. The surface of the main piece is smoothed again and the process is repeated. 1/2, 1/4 and 1/8-in. banding were possible using this method. Making banding is a great example of the kerfing plane allowing new techniques and possibilities in the hand tool only woodshop. the stock being so thin, makes it difficult to hold onto and saw, with any degree of accuracy. The kerfing plane made this job easy, accurate and repeatable. Once sawn, the banding is fine tuned on the shooting board. How would you make 1/8-in. banding in your own shop? Would you be able to saw thin strips or would you use a combination of saw and hand plane? I’d love to hear your thoughts- leave me some comments below. Until next time, enjoy the Good Dr.’s Medicine Chest Part Four. The music in this video is a few loops I tied together one morning two years ago. They’re mostly stock samples direct from Garage Band- nothing too fancy, but a suitable soundtrack for this clip. That post answers my questions. Time to hit the bench and put this new plane to work! I’m curious if you use a cambered blade with your low angle jack plane. The various blade options available with these planes is also a bit mystifying but potentially a real plus from what I understand. I know that this is a bit off topic for your post, but your comments, as always, would help clarify things. as always, thanks for the questions and comments. First of all, your blog is a daily read for me. While I’m not dedicated solely to hand tools, I find myself gravitating to them more and more, and your site has taught me not only how a shop can operate using only hand tools, but in many cases after gaining some proficiency is actually more efficient than a power tool only shop. It seems to me that machines only really save time in production, not one of a kind projects. Anyway, keep it up. You are an inspiration! If I might attempt to clarify a point I think Kevin was making – could one use a panel saw in conjunction with the kerfing plane to achieve the same result? Or is it still better to use the frame saw? I plan to make both, but if I make a kerfing plane first, id like to get right to resawing while the frame saw is in progress. many thanks for those thoughtful comments- I sincerely appreciate the feedback from readers. As for Kevins point, yes- you can follow the Kerfing Plane with a panel saw, provided the panel saw plate is as thin as the Kerfing Plane plate. As I’ve mentioned in previous posts, the kerf creates ‘the path of least resistance’, and while this isn’t 100% fool proof, it does make any sawing task easier by assisting the saw in maintaining the desired path. Short answer to your question is that I think that I’d try to saw the banding. I’m very new to woodworking (read: made a small dovetailed box and a saw bench and don’t even have my workshop ready…maintaining a healthy marriage dictates that I finish renovating the basement before I setup my workshop) but it seems to me that the better you are with a saw and a chisel the less planing you will have to do. I’m looking at this more from a time and material saving viewpoint than a “I hate planing” view point. Am I correct in this suspicion? On a slightly related note, have you ever tried using a panel saw instead of the framing saw to cut the banding from the stock? I recognize that the framing saw is better but I’m curious if a panel saw would work. I think you’re right, the more comfortable you are with sawing, the closer you’ll saw to a knife line which translates to a little less planing. As for using a panel saw- absolutely; before I made my frame saw I used the panel saw for all of my resawing needs, but sawing 1/8-in. banding with any degree of accuracy, would indeed be a challenge. On the last step it looked like you were jointing on the shooting board. Why not use a wide board to reference up against your stop, instead of that thin strip? I was cleaning up the banding after sawing and for sure, you could use anything to keep the banding engaged to the shooting plane. I only used that thin strip of walnut because it was the offcut from the piece I had just cut and was the same thickness. That allowed for better sight lines but for sure, you could certainly use a wider board.